You all had to know that there was no way I was going to get through this theme without doing a Doctor Who design. 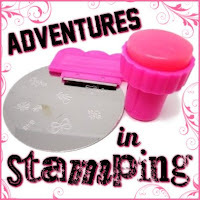 And thanks to my completely awesome stamping plate from MyOnline Shop I have some new images to use! I decided to go in a different direction with this design. I have been really feeling the pastels lately and wanted to make them the base for my manicure. I started with two coats of Barry M White. I dry brushed Dragon Fruit first. I used a variety of Doctor Who images from Jr31 and stamped with Blue Grape. To add to the "space" look I applied one coat of Northern Lights. These images are brilliant! There is so much geek love on this plate! One of the best purchases I have ever made! Love how colorful these turned out! Very groovy color choices! You inadvertently took us back to the original 60s series! omg i need a weeping angel stamp! I love these nails and those stamps are awesome!